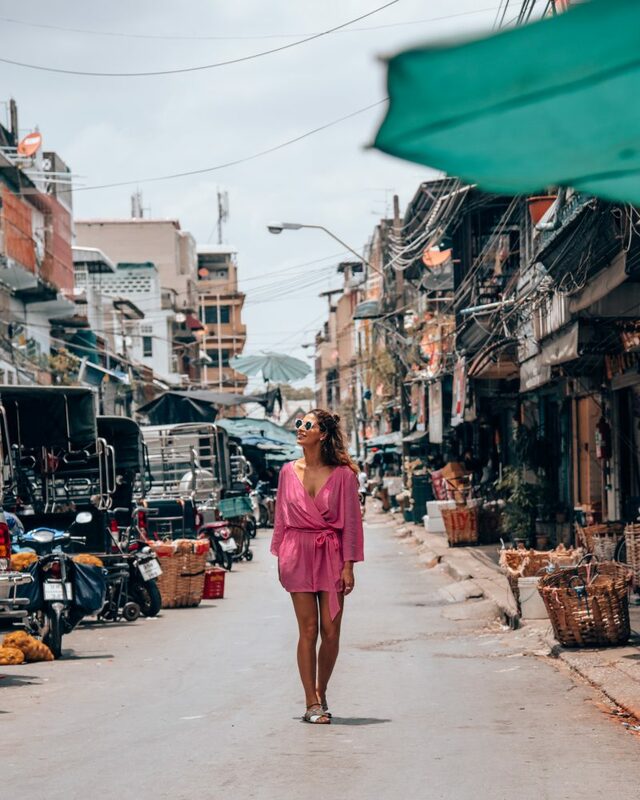 After 5 days of exploring Cambodia, Aggie and I flew to the northern part of Thailand, Chiang Mai to start a 10-day adventure with the Amazing Thailand Women’s Journey. Every August, Thailand celebrates women & emphasizes how easy it is to travel Thailand as a female (solo or not). During the month of August, women get expedited lines at the airport, free SIM card, deals on food, accommodations, tours, taxis – you name it. Thailand is one of my favourite countries I’ve visited, not only for the amazing food, (although I could eat Green Curry for the rest of my life) but the people are so wonderful and kind. 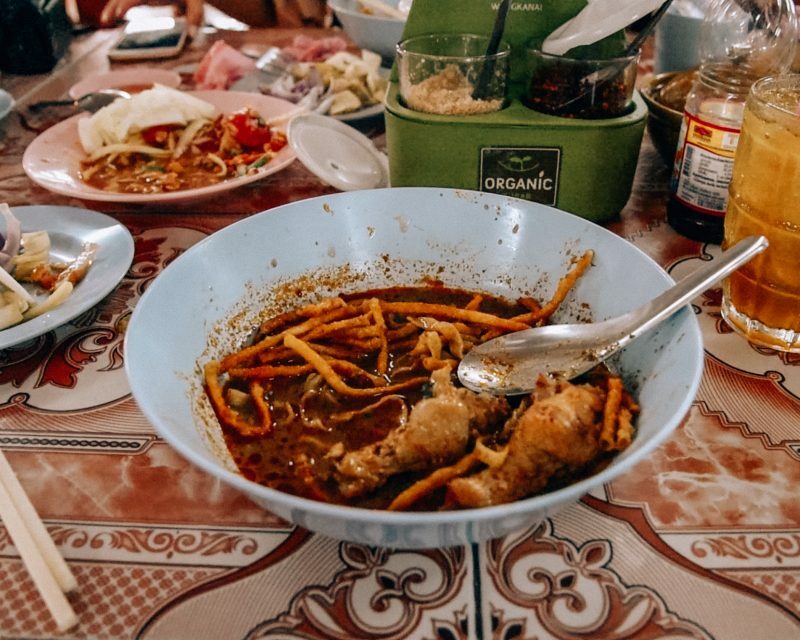 We landed and made our way to our hotel – Akyra Chaing Mai. The hotel was brand new, had a really modern feel and by far my favourite hotel we stayed at on this trip! Everything from the breakfast to the unique turndown service had us in awe, a giant outdoor bathtub in the middle of our room, and let’s not forget about the rooftop pool!! (seen below) I would recommend this place to anyone when visiting Chiang Mai! Chiang Mai is so beautiful, filled with temples, great cafes/ restaurants, and lots of greenery. I had visited this northern city 3 years ago on a solo-backpacking trip, and although you aren’t near the water there is so much to experience here. First order of business was for us to try a soup called Koa Sao, signature to the North (curry soup with rice noodles). This soup was a serious game changer for us! Our guide Tippy took us to the local market where no one spoke English and no foreigners in sight. In my opinion these kinds of places always have the best food as they are very traditional & local spots plus they are typically dirt cheap. The soup cost us 40 baht (about $1.20 USD), try finding anything back home for that cheap! I will be dreaming of this dish until my next trip. But if you are curious about Thai cooking and can’t wait that long the chef at our hotel was kind enough to share his Thai Green Curry recipe here! Tippy also surprised me with Thai sausage, something I have been raving about since I last tried it. Filled with lemongrass herb, it’s by far the best I’ve ever tried & I’m so happy it still met my expectations considering the 3 year hype I’ve been giving it lol. The following day we packed up from Akyra and moved to the Anantara hotel where we were spoiled with one of the most relaxing massages I have ever had! Our hotel room resembled a penthouse, it was huge!! Aggie and I each had our own private bedrooms and individual bathrooms. Don’t get us wrong we loved sharing a room together we would stay up late being silly and have editing parties but nothing beats your own bed where you can really sprawl out! Best part for us was when a hotel served up Green curry for breakfast, lunch and dinner, it was always the first thing on our plate in the morning. The next day we drove up to the mountains to visit Patara Elephant Sanctuary. I’m always a little weary of doing these kinds of excursions, as I want to ensure that I am not involving myself in any animal cruelty. 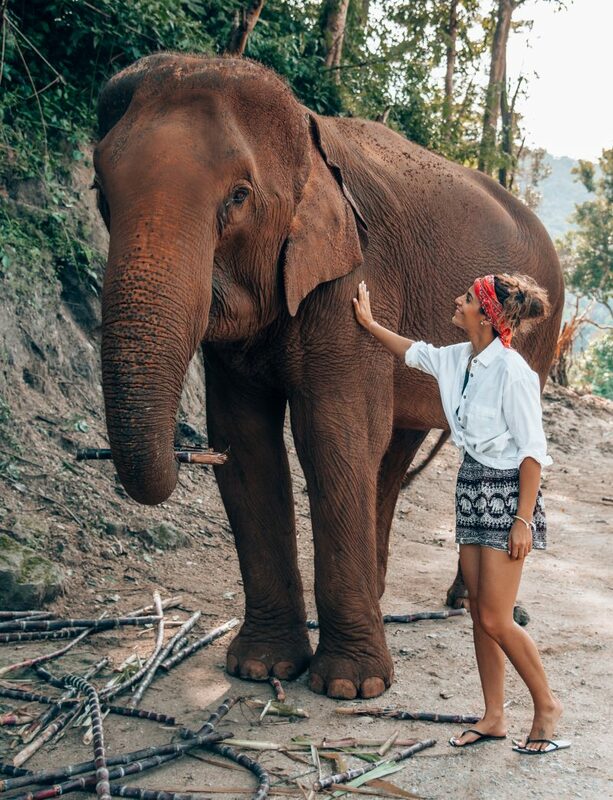 To my surprise sanctuary was really educational, we spent the afternoon learning about the elephants and their skincare routine, we even got to get in the river and bathe them! After a quick lunch and a little more time with them it was time to return home and back up for the islands. The next morning we flew to Koh Samui, ready for beaches and palm trees. We landed and immediately found ourselves by the beach eating coconut ice cream (my heaven). 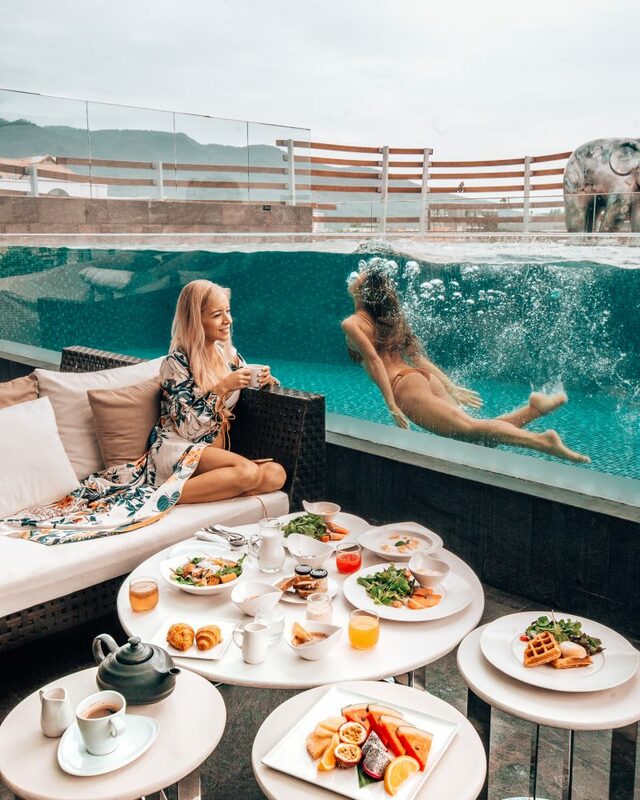 We spent the next few days enjoying our private pool villa at the Conrad, and the lavish dinners at the W hotel and Six Senses had our palettes doing backflips! We visited a coconut plantation and learnt that Koh Samui used to be called Coconut Island. 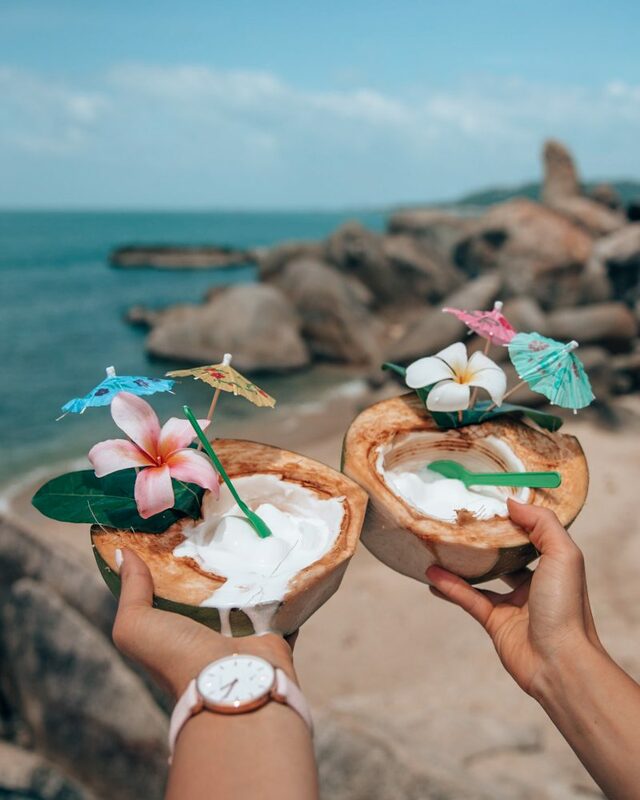 And because of the increase in tourism (and increased love for the coco) over the recent years the islanders have had to plant more coconut trees to keep up with the demand. Last year alone they planted over 100,000. On our last full day on the island we took a speedboat ride to visit some of the small islands within the Angthong National Marine Park and experience a unique lunch in a local fishing village. The best coconut ice cream! The next day we flew into Bangkok. It was so cool being back in the city and revisiting places I had seen on my last visit here in 2014. When we arrived, Aggie and I separated from the rest of the group to allow them to shop in the city while Aggie, myself and our new guide Peach searched for the best photos spots in the city to photograph. We checked into our final hotel, the St—Regis. This hotel was easily the most high end hotel I had ever stayed at offering you a personal butler who brought me tea every morning, had my clothes pressed and even packed my suitcase for me! Yes I said it, he packed my suitcase on my last day while I went out to enjoy breakfast and the city for a few more ours. Bangkok is such a vibrant city filled with so many things to do. I could go on and on about what you can do here but I want to give you our biggest highlights. First we had our sights set on visiting the Unicorn Café. 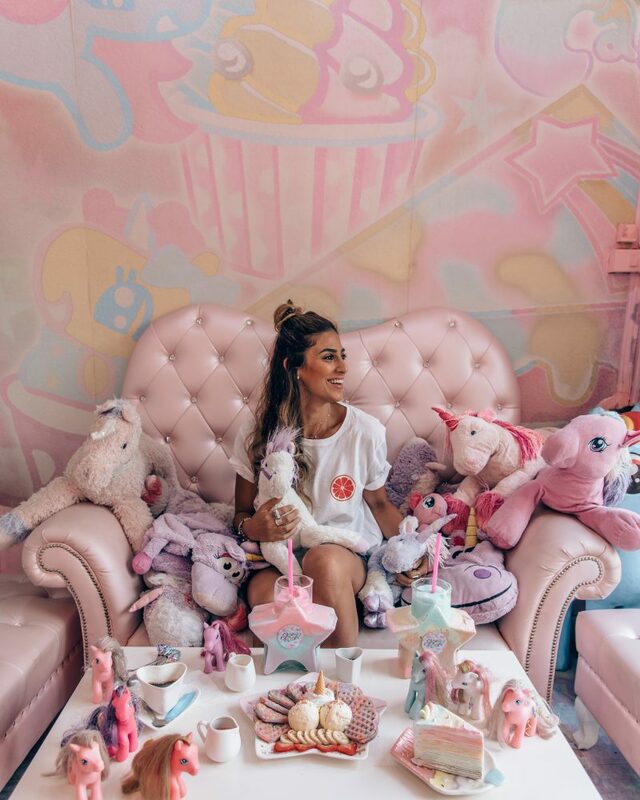 We walked in and were instantly transported back to our childhood as the entire place is filled with pastel colours and My Little Pony. A little girls birthday dream! Check out the size of these smoothies and unicorn coloured waffles! In the early evenings we visited several rooftop bars before heading to dinner. These rooftop bars have the best views of the city. 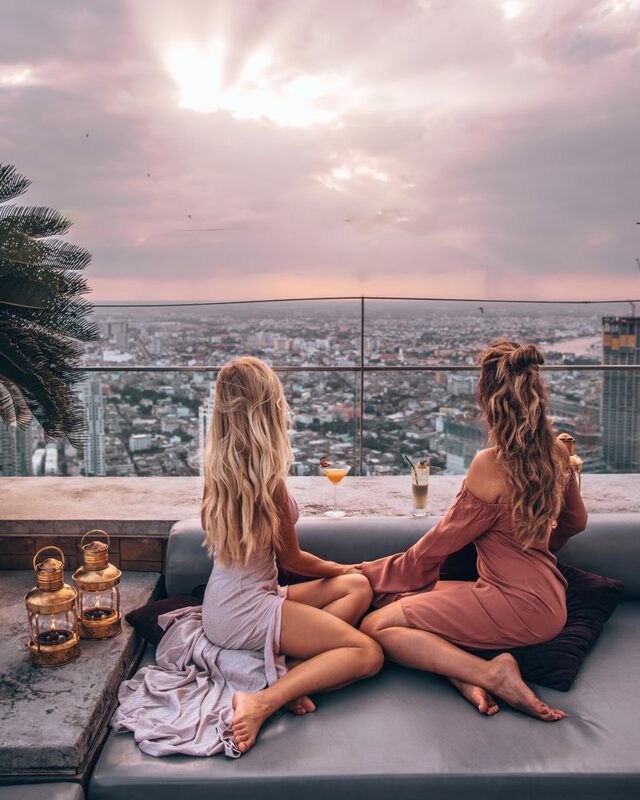 Aggie and I both asked you on IG stories for the best bar in Bangkok and based on your recommendation we visited both Lebua’s Sky Bar and Banyan Tree’s Vertigo. 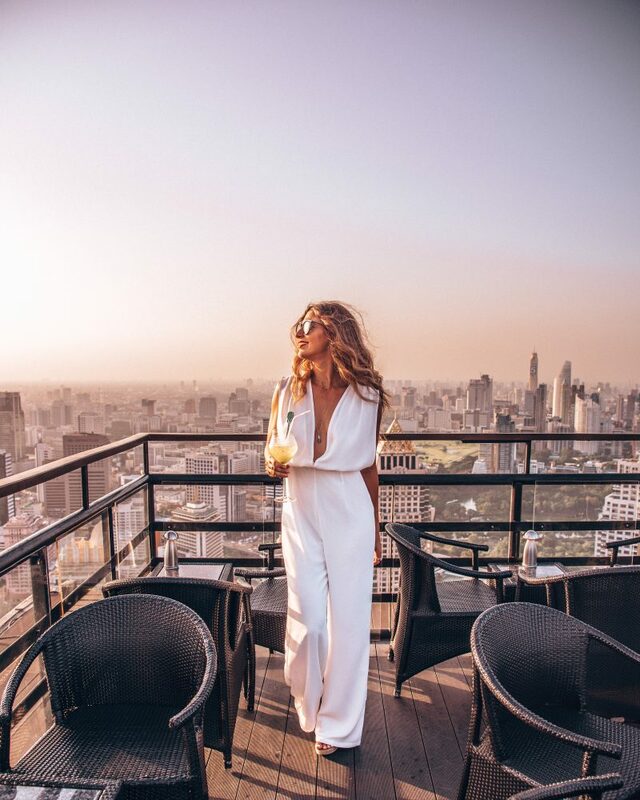 I had been to Sky Bar before and it still remains my favourite rooftop bar, nothing beats it’s view it’s view of sunset overlooking the river from the 66th floor. And yes, it’s where the Hangover II was filmed. It was a great way to celebrate the end of this time together. Little tip: if you are going there expecting to get photos go early! We arrived around 5pm and shot these pictures at Sirocco (the bar next door on the same floor) because it opened earlier. We had the place to ourselves for about 30 mins and afterwards made our way over to Sky Bar. 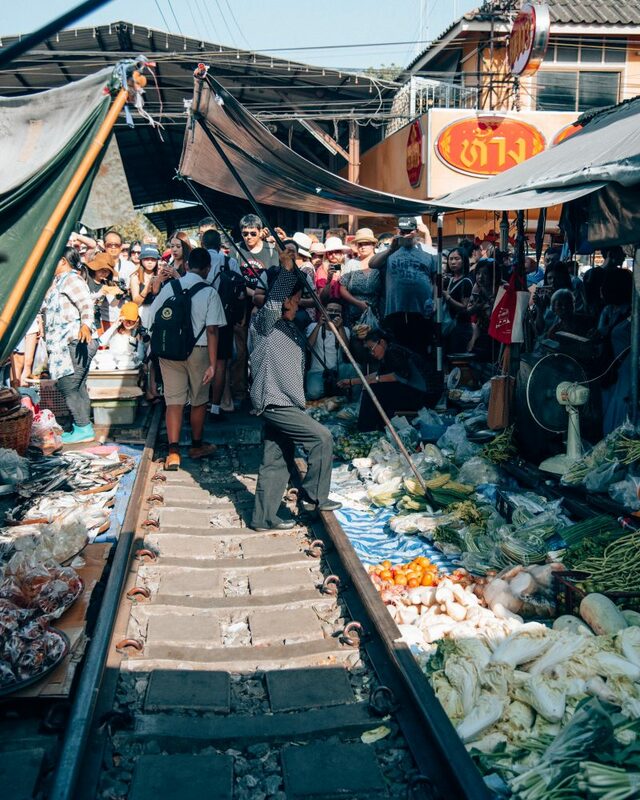 The following morning we woke up early and made our way to the Maeklong Railway Market just 30 mins outside of the city. To be honest I had never heard of this market before and it has to be one of the coolest moments of the trip! Unfortunately we don’t have any photos from it as we didn’t realize how close the train actually comes. It’s the craziest thing, one minute you’re buying fresh produce off an old lady and the next the train blows by and as soon as it passes everyone puts their products back out as if nothing ever happened. You blink and you miss the entire thing and the train comes so close I was worried one of us was going to loose a toe. Thankfully we left all in one piece and despite not having been able to capture it, it would definitely be something I recommend doing. The Floating Market another 45 mins out of the city (we went straight after the railway market) and I think Aggie and I could both say that it was one of the favourite experiences on this trip to Thailand. I had wanted to visit here 3 years ago but never made it so this was a major bucket list item I could check off. We waited to find the cutest most authentic looking Thai man and rented a boat from him rather than piling into a boat filled with other tourist, we paid a little extra and got our own so we could take our time with photos and enjoy the experience. I know it may be strange to reference Thailand to Italy but it almost felt like a gondola ride sitting on the floor of this long boat. If you wanted to purchase anything from the local market vendors you had be quick to jump on it as you’re floating by, I’m so indecisive so it was a struggle for me. Vendors will be serving anything from jewellery to food to souvenirs, anything you can think of. On our last and final night in Bangkok the Tourism Board of Thailand hosted a Gala at a traditional Thai house which is now a major landmark for the city. It was a beautiful evening filled with incredible women such as Miss Universe, Miss Vietnam and Miss Thailand to name a few. As well as a 4 course menu, a fashion show & live music. Thailand is a country that pulls tighter on my heartstrings with each visit and I am already looking forward to going back. I hope you all read this and start planning your trip to visit this incredible country! One of my favourite moments & a perfect way to close off this incredible trip together! Love this post, Lisa! Thailand sounds amazing! Aww thank you so much! I love Thailand! One of my fav countries!! Thailand is a place I hold close to my heart. If you’ve never visited you should definitely plan a trip. What a gorgeous post, love seeing you here with Aggie too! A honeymoon in Thailand sounds wonderful. It’s such a beautiful place that I love so much. And yes memories with Aggie are the best. Please tell me what filters you use for photos ? Hey!! So sorry for the delay. For Thailand I used the Travel Essentials mostly but I’m currently re-working all of them. On count down for Thailand … 43 days to go …. Thank you for recommending places to see… can’t wait. 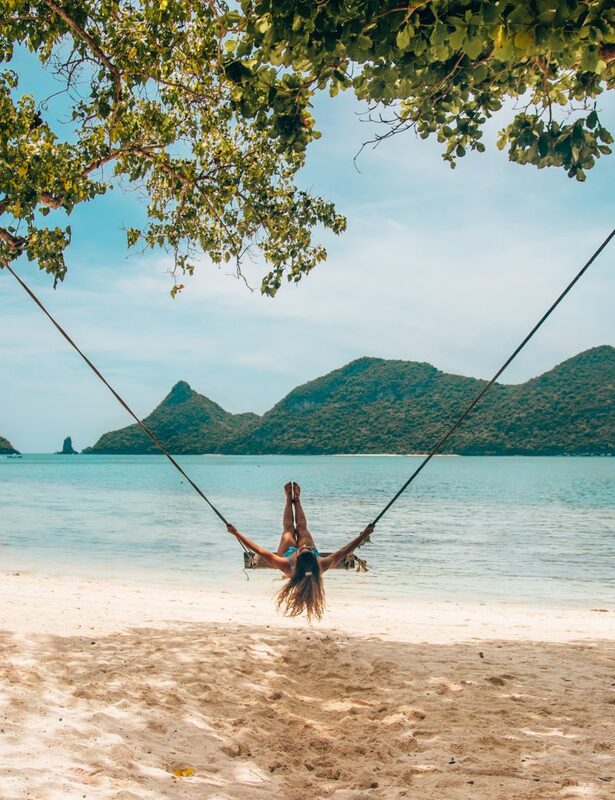 It’s a Girl holiday….. waiting for the fun to begin…..
Omg Heather, a girls trip to Thailand sounds amazing. You’re going to love it!! Loved your pics I need to go back to Thailand ASAP! Yess!!! I absolutely love Thailand!